This year, UB's Composition program welcomes six extremely talented new composers. We're excited to get to know them and their music, and we look forward to hearing what they come up with as they pursue their PhD's in Buffalo. Jessie Downs is a composer, vocalist, and teaching artist who recently graduated from Oberlin (2013). For Jessie, music is a medium for sharing personal experiences and entering into community with others. "My work aims to capture things of delicate and wild beauty, from the sound of my mother's backyard, to the decrepit intonation of an antique folk instrument, to elements of the work of other artists […] that resonate deeply with my own practice and view of the world." Her most recent large-scale work, a piece written during a residency with a middle school band called Dismal Harmony, is a "a surreal sonic expedition." Each section of the piece strives to capture the experience of a particular point along New Jersey's Dismal Brook. The musical material comes both from harmonies and textures that resulted from a composing workshop with the band, as well as from Jessie's own time spent with the sounds of the park. the NJPAC “Fiddle and Fa-la-la” Fest. In writing for non-professional musicians, Jessie combines her love of music-making and education. Since graduating Oberlin, she has worked primarily as a music educator in Orange, New Jersey, where she played a vital role in creating Sonic Explorations, an after-school music program for the elementary school students. 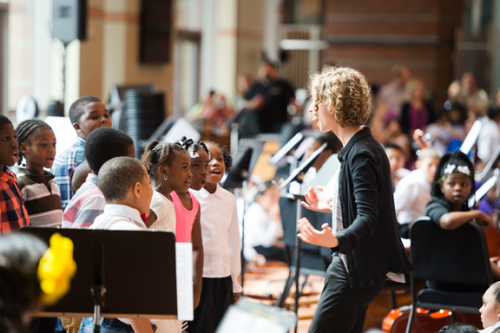 "As a way of creating a space in the program for each student to find their own musical persona, my partner Douglas Farrand and I developed the Creative Musicianship curriculum, in which students build an embodied understanding of key musical concepts through and for creative applications (composing, improvising, instrument building, etc)." As a vocalist, Jessie practices what is often considered an "arcane strain" of the bel canto technique. With an approach to vocalization that is much like a gym workout—complete with its grunts and squeals—she aims to build vocal musculature through the practice of a variety of 'raw sounds.' "The element of struggle with one's voice—both physical and psychological—and the divine variety of timbres, registers, and dynamics that (sometimes) result from this struggle, is a subject of great interest and importance to me." Alex Huddleston studied composition at Columbia College Chicago with Marcos Balter, Kenn Kumpf, and David Reminick, and recently completed his Masters degree at the Boston University School of Music, where he studied with Joshua Fineberg. A recent piece of his for pianist and assistant, neglected Gardens; layers of rust, patina, and rock, treats the piano as a complex assembly of mechanical objects and vibrating entities. In the piece, the pianist sits at the keyboard while the assistant reaches into the body of the instrument and plays directly on the strings. "As a composer, my interests tend toward oblique criticism of structures of music making in various traditional forms." The work treats the piano as a series of oscillators in a great "analogico-mechanical synthesizer." Brien Henderson's recent compositional work examines the introspective power of medieval plainsong and the textured melodicism of Renaissance polyphony. Strongly guided by architect Antoni Gaudí's claim that "originality means returning to our origins," Brien reimagines these timeworn elements in a pitch organization system of his own invention that "embraces the full chromatic spectrum while maintaining a decidedly modal character." Brien's work also treats noise elements, timbre, and musical fragments as essential material. A June in Buffalo alum, his piece Fragments of Lost Words was performed by Ensemble SIGNAL at the festival in 2013. Brien has studied composition with Richard Festinger, Christopher Jones, and Ben Sabey at San Francisco State University, where he earned both Bachelor of Music and a Master of Arts degrees. Also a singer, for the past two years he sang with Ut Re Mi, a San Francisco-based choir specializing in Renaissance music, and for whom he composed Noli esse vana, a setting of a text from The Confessions of St. Augustine. Igor Coelho Marques hails from Curitiba, a large Brazilian city 500 miles southwest of Rio de Janeiro. Beginning his musical education at the city's public conservatory, he soon transferred to Brigham Young University, where he received his undergraduate degree in composition. He later pursued a Master's degree at the University of Utah before arriving in Buffalo for his PhD. Igor's style and skill is on display in his 2014 piece, I Win, for pierrot ensemble. "At the time, I was taken by the idea that even when people discredit you, if you trust your choices and cherish meaningful relationships, you 'win' in the end." Each of the five instruments is highlighted in a different section of the piece; the composer giving unique material and a characteristic affect to each part, with a conclusion that brings together all the disparate elements. Nathan Kelly is a composer interested composing for large ensemble forces and in post-minimal music. Derick Evans is a New York native who grew up just outside of Utica. Spending his youth performing as an electric bassist in various bands—including his own instrumental jazz-rock trio—he went on to earn his Bachelor of Music degree from the College of Wooster. He later earned his Master of Music degree from The University of Arizona, where he studied with Daniel Asia. While in Arizona, Derick served as instructor of a self-designed undergraduate music course focused on improvisation and composition, and earlier this year he founded ensemble D.E.R.F., the school’s first ensemble dedicated solely to performing student works. D.E.R.F. has performed a variety of works, including Derick's own GILA, a "quirky and playfully irreverent" piece composed for the ensemble. Derick's academic interests center on American composers, rock music theory, and the assimilation of popular styles in Western concert music. Derick is excited to leave the Southwest for a cooler northern state. "Having spent the last two winters in Arizona, I’m excited about the changing seasons and experiencing a snow-filled winter this year in Buffalo. Although I admit that, having been away for so long, I may have a nostalgic and romanticized recollection of what the snow is like. My boots and I will find out soon enough."